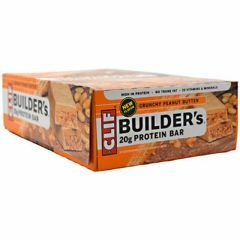 AllegroMedical.com presents The Clif Builder's Protein Bar - Crunchy Peanut Butter Meal Replacement Bar. High In Protein. No Trans Fat. 23 Vitamins & Minerals. 20g Protein Bar. The Protein Bar That Works As Hard As You Do. You're not done. You're a work in progress, building toward something big. That's why we made Clif Builder's - the great-tasting protein bar that makes every ingredient count- so you can get the most out of your workout. Builder's has 20g of complete protein, the vitamins and minerals you need to boost protein metabolism, and carbohydrates for sustained energy. Builder's never contains ingredients like artificial sweeteners, sugar alcohols or trans fats. Every Builder's ingredient serves a purpose, so it can best serve you- and all you're working toward. Gary, Founder and Owner of Clif Bar & Company. Soy Protein, Beet Juice Concentrate, Organic Brown Rice Syrup, Organic Dried Cane Syrup, Palm Kernel Oil, Organic Peanut Butter, Organic Peanuts, Natural Flavors, Organic Rolled Oats, Vegetable Glycerin, Organic Soy Flour, Inulin (Chicory Extract), Soy Lecithin, Peanut Flour, Rice Starch, Organic Vanilla, Salt, Organic Oat Fiber, Organic Sunflower Oil, Organic Palm Kernel Oil, Organic Peanut Flour. Vitamins & Minerals: Dicalcium Phosphate, Magnesium Oxide, Ascorbic Acid (Vit. C), Tocopheryl Acetate (Vit. E), Ferric Orthophosphate (Iron), Beta Carotene (Vit. A), Zinc Citrate, Phytonadione (Vit. K1), Biotin, Niacinamide (Vit. B3), Calcium Pantothenate (Vit. B5), Potassium Iodide, Manganese Gluconate, Copper Gluconate, Sodium Selenite, Thiamin (Vit. B1), Chromium Chloride, Cyanocobalamin (Vit. B12), Sodium Molybdate, Folic Acid (Vit. B9), Riboflavin (Vit. B2), Pyridoxine Hydrochloride (Vit.B6).